The Dell PowerEdge 1900 has several controller options available. 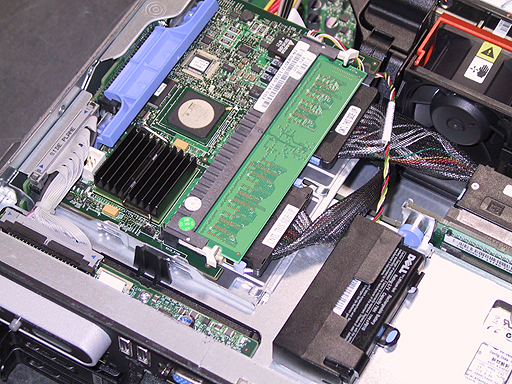 Simple SATA RAID 0, 1 or non-RAID configurations can make use of the onboard controller by connecting the hard drives directly to the SATA ports on the system board. For more advanced RAID levels such as RAID 5 & 10, an add-in PERC 5/i controller is required. A rechargeable lithium-ion battery back-up (BBU) is provided with PERC 5/i controllers to protect write cache in the event of a sudden power failure. These batteries are known to eventually lose their ability to hold a charge. When this happens, the battery must be replaced. There are also external and non-RAID controllers available. Unless otherwise noted, controllers are tested and pulled from working servers and backed by our 90-day parts replacement warranty.